This week, I interviewed Stefan Durham, an international swing dancer and instructor who will be teaching two specialty classes at Boulder Swing Dance this August. 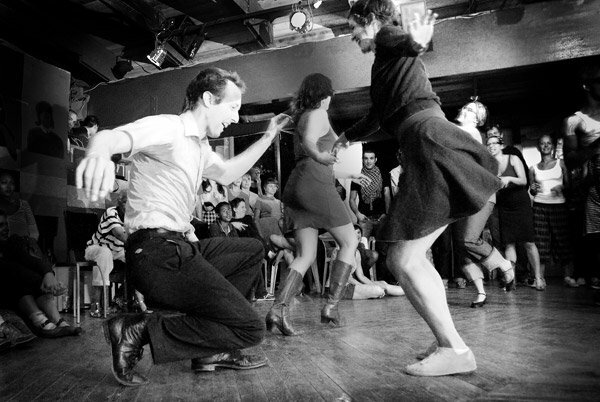 The first class, Footwork from the Roots of Lindy Hop, will be held August 6, and the second, Expanding Space and Time in your Lindy Hop, will take place the following week, on August 13. Read on to learn more about these upcoming classes and about Stefan’s philosophy of dance. LH: Could you talk a little about what you’ll be teaching this week? SD: The first one is footwork variations that everyone can do, both lead and follow. I’ve done a lot of dance stuff besides Lindy hop, like West African dances such as those from Guinea, Burkina Faso, and old Mali. Obviously, there’s a lot of liaison between West African dance and Lindy hop; there’s been a transmission of those same rhythms and steps. So we’ll be working on footwork taken from that kind of stuff. It’s a cool thing to notice how the same kind of step, like the Charleston, comes up in every major dance era: the Soul era, 80s hip hop, the mashed potato in the 50s…. It shows how these core steps can be played with in an infinite number of ways. I guess that’s what gives me the courage to dance simply and play with things on a rhythmic level and on a level of riffing with my partner. How about next week’s class? In the second class, the focus will be on getting comfortable with dancing in a simple way, in a listening way, and getting into grooves wherein you can use basics to do an infinite array of rhythmic hits. Being dynamic with the basics, but also adhering to certain body disciplines: being on balance, being in the low center of your core. There’s also a psychological aspect to it. It’s kind of ineffable, but one word that seems to point at it pretty well is “realness.” When you’re dancing not from a fear-based place, or a hyperactive place, but from a place of total calm and presence with your partner. That in and of itself creates spacious dancing. It also makes it easier to dance really fast and really slow, places where people’s dancing tends to fall apart. One of the greatest gifts I got from my few classes with the old-time dancers, and also the endless hours of geeking out that I’ve done watching them, is to absorb their way of dancing that’s at once exuberant but also very real and effortless. If that can be apprehended in a felt way, you can recenter yourself in that feeling at any point in your day-to-day existence. And I think it’s attainable for pretty much everyone, if you spend a little time working on those body disciplines and mental disciplines in your dancing. So, have you done mostly Lindy hop overall, or has it been more balanced between different dances? It’s definitely been mostly Lindy hop overall. I’ve also done a ton of West African dance, like I was saying. I had an amazing teacher in Portland, Oregon, when I first got into dancing, who blew me away. That’s actually how I got into dance in college; I took a West African dance class. In fact, that’s how my dance partner, Bethany, and I, met. That was our first mutual dance love. I feel like it’s helpful to do other types of dance, even if you’re a Lindy hop obsessive. Yeah, it definitely seems good to keep practicing that ability to react to new things instead of getting stuck in the same old moves you already know. That informs a lot of the Lindy hop I teach: being able to dance with anyone while maintaining total self-integrity, rather than predicating everything you’re doing on taking care of the other person all the time. Self-integrity is a really important thing that gets lost sometimes. You see people who, on a technique level or a psychic level, become codependent. Do you mean like when you get too used to dancing with the same person all the time, or in general, no matter who you’re dancing with? In general, I think. It’s natural when you’re first starting out to have some insecurity, which then manifests in these technical ways, like asking the other person to hold you up, weight-wise. Or when leads use their arms and upper body to moderate the connection so they can “take care” of their partner, rather than focusing on their own balance and their own body integrity, which would allow their partner to tell what they’re doing a lot more easily. I feel like you do have to allocate time to both: to exuberant dancing and to more disciplined time, when you’re really hammering the basics and practicing self-observation. But you wouldn’t want to foreclose on that exuberance that starts to come up when you reach certain stages, when you have more facility and more flow, and suddenly feel like you can do anything. Those are all crucial milestones. So, I heard that you used to compete a lot. What was that like? It was exhilarating for a long time. We stopped doing events in part because it was exhausting, and because the environmental impact of all that flying started to wear on me psychically. But we got to know a lot of amazing people, and I still feel lucky to have connected to the larger swing community—all these top-level dancers who tend to be inspiring people because they have the focus or discipline or obsessiveness to keep drilling these things over and over. I have a theory that probably 90% of the Lindy hoppers at the very top of the scene are a bit obsessive in some way or another, because what else would compel you to drill this over and over for so many years? There’s no money in it! But it’s also just a compelling medium, a compelling dance technology. In all my dance experience, it’s the coolest partner dance out there. It can be really profound. Bethany and I both really liked performing a lot, and getting to share what we were passionate about. When it comes to freestyle competitions, historically I tend to choke, so I’m always really in admiration of people who can share their effortless sense of fun in an improvisational setting onstage. I’ve done a few mix and matches, and they’re really fun, but it can be stressful when you want to do well. I have to remind myself not to get too competitive about it when I’m not an expert. Like, if you’re not that good, it doesn’t matter! It super doesn’t matter. It ultra doesn’t matter! That’s the conclusion that Bethany and I have come to after years and years of dancing: Lindy hop is like life, and Lindy hop is not serious. Ergo, life is not serious. Newer PostHeather Ballew wins first place! Older PostFree Teahouse Dances & Lessons in August!